Auto-Scheduling: the best scheduling update ever! When my co-founder (Steve Shelley) and I first created Deputy, we had a simple goal in mind – Make it easier for Steve to manage his growing team of shift workers, so he could spend more time focused on big ideas and less time worrying about scheduling. Today, Deputy is all grown up, and helps a lot more people than just Steve! Since 2008 we’ve served over 75,000 businesses, scheduled more than a million workers, and powered 100 million shifts! It’s now our mission to change the lives of shift workers, globally. Which is why we’re more excited than ever to announce a new feature that is truly a massive leap on this journey. It’s a feature that will radically transform the lives of every business owner or staff member that creates schedules in shift based businesses. It’s called Auto-Scheduling, and it’s awesome. With a single click, Auto-Scheduling will build you the perfect shift structure from scratch, then fill it with the right people for every shift based on your scheduling priorities. If you currently use our Auto-Fill feature, some of this might sound familiar, which is right. But Auto-Scheduling is a whole lot more than Auto-Fill. Using Auto-Scheduling, you can build and fill your schedule, all with with a single click. Scheduling: The highly complex problem! Creating the right schedule is hard. For many business owners it requires a lot of time and effort, and results in unnecessary stress that takes time away from the jobs that really matter – like looking after customers. Firstly, you have to determine how many shifts you need. This usually involves some pretty tedious calculations that account for the day of the week, the season and how many sales you think you’ll make – and that’s before you start thinking about the things you don’t control, like the weather, or extra crowds on their way to the big game. As if that isn’t hard enough, you then need to balance a bunch of competing business priorities and compliance requirements to fill your shifts in a way that works for you and your staff. Not easy! The way most business owners solve this puzzle is a healthy dose of intuition, relying on the tribal knowledge that comes with intimately knowing your own business to create the best schedule possible. Which might work at times, but it’s not perfect. Put simply, there’s just too much complexity and too little time to consider everything, resulting in suboptimal schedules that cost businesses real money and create significant risk from a compliance perspective. That’s why we’ve created Auto-Scheduling. Auto-Scheduling takes the effort and the guesswork out of scheduling. It allows you to account for every factor that influences how many staff you’ll need at any time, and for every rule that determines when your staff should or shouldn’t be working. It codifies your tribal knowledge, and empowers your managers to create the best schedule every time. The best part? Once you’re set up, it does all of this with a single click. Auto-Scheduling uses artificial intelligence to build you the best shift structure for your business, based on as many demand signals as you require. Put simply, a demand signal is anything that affects how many people you need working at any given time. Let’s take a small cafe for example. As owners of the cafe, we know that extra staff are needed for the pre-work coffee rush, then less through the morning, until 11 or so when the brunch crowds roll in and things get crazy. But understanding exactly how many staff we need at any given time is based on tribal knowledge, not science. Using artificial intelligence, Auto-Scheduling can analyse historical and forecast data from multiple demand signals, like sales, foot traffic numbers, and table bookings, to accurately forecast how many staff the coffee shop would need for each hour of the day. Demand signals can be broken down even further to forecast staffing requirements with greater accuracy. For example, more coffee orders require more baristas, and more menu orders mean you need more people in the kitchen and waiting tables. And for more accurate start and stop times, data can be broken into 15 minute blocks. In Deputy, we’ve made it super easy to add your own demand signals and import relevant data. Simply click ‘add new metric’ for each demand signal in the far left corner of the scheduling page. You can then input data for each signal manually, import it using CSV or Excel files, or even set it up to pull automatically from other apps, like your point of sales system. For each demand signal, you can forecast labour demand using insights from recent periods (like the past month), or even the same time last year. Using the same period last year allows you to accurately account for the staffing impact of one off, major events, like the big games or public holidays. Enterprise customers can also integrate with 3rd party applications, like the weather, movement patterns, or Google traffic, so you can better manage the impact of the things you can’t control. Using the Required Staff builder, you then determine the exact number of staff to schedule in each area, based on each demand signal. We call these ‘Required Staff recipes’. Building your Required Staff recipe means any schedule created is completely optimised for your specific business and scheduling needs. Continuing with our cafe example, we can set the Required Staff builder to schedule one barista for every 60 coffee orders expected each hour, and one chef for every 20 meals ordered. We can also make sure we’ve got one waiter for every 30 people that come through the door. I’ve used basic numbers here as an example, but as a business owner I’m sure you’ll have a clear idea about the labour ratios required for your business, so you can get more specific. If not, you can always test and adapt your Required Staff recipes on the go, figuring out the best labour ratio for your business over time. Required Staff recipes makes your ‘tribal knowledge’ instantly available to you, and every staff member who creates schedules for your business. Every time a schedule is created using Auto-Scheduling, it will be based on the specific Required Staff recipes you have developed. And because every location is different, Auto-Scheduling lets you build custom recipes for each one. Meaning each schedule is optimised for each location. Once you’ve set up your demand signals and built your Required Staff recipe(s), Auto-Scheduling will take care of the heavy lifting and build you the best schedule again and again, with a single click. This is when the magic starts. Whilst you can achieve the following two steps with a single click (using the ‘Auto’ button), I’ll describe it in two using the drop down menu with Auto-build and Auto-fill fill buttons. Using data from each of your demand signals and your Required Staff recipes, Auto-Scheduling will build you the optimum shift structure (a series of blank unassigned shifts in assigned areas with start/end times). An optimum shift structure means you have the right amount of people working in every area, at all times. For our coffee shop, that means no wait staff lounging around out back, and enough baristas out front to make sure the line for coffee isn’t out the door, losing you precious sales. 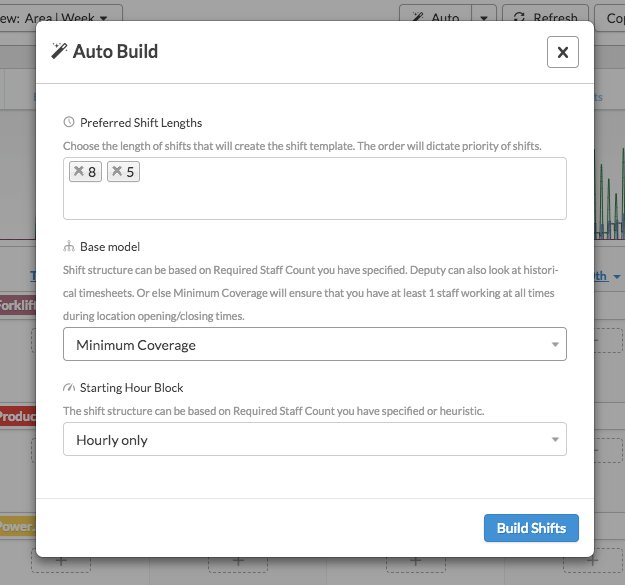 For Auto-Build to create your shift structure, you simply need to fill in 3 criteria. Preferred Shift Lengths – The relevant shift lengths for your business. This ensures Auto-Scheduling won’t create a shift that’s shorter or longer than what works for your business. Desired Schedule model logic – We expect most customers to use the Required Staff logic (using the recipes set up above), but there is also the option for Auto-Scheduling to copy and learn from previous schedules, or simply schedule the minimum coverage required for each area (1 person per area, at all times). 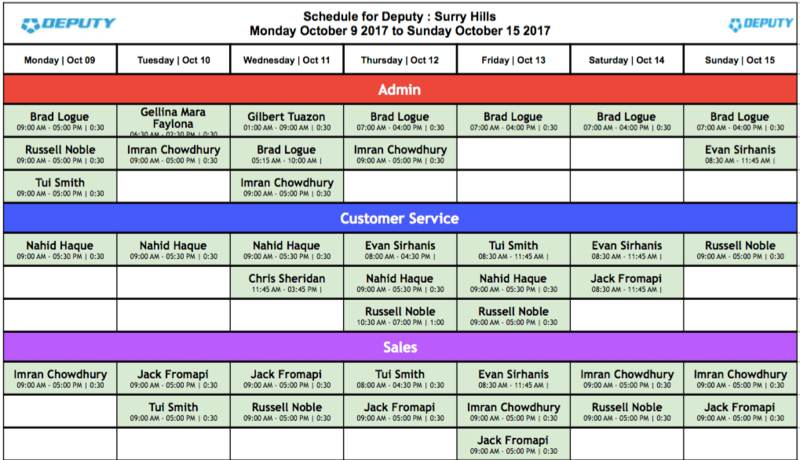 Shift start times – Whether you want each shift to start on the hour, or let Deputy learn what start times will best suit your business. Once you’re happy, simply click the button and Auto-Scheduling will analyse your demand signals, Required Staff recipes and the relevant criteria to create an optimised shift structure for your business. Once you have your shift structure, Auto-Scheduling can then go about filling it with the best person for every shift, based on your scheduling priorities. Or, you can create customised priorities (referred to as Auto-Fill Advanced Recipes) to account for more complex labour and wage rules in your state or country. Then just click the button, and that’s it. Auto-Scheduling will evaluate all possible combinations to provide you with an optimised, legally compliant schedule for your business. Auto fill doing its magic! It will never schedule staff into overtime hours, or ask them to work during their time-off. It will build the best schedule it can find within the boundaries of the business rules that you’ve defined. Now can you see why were so excited? 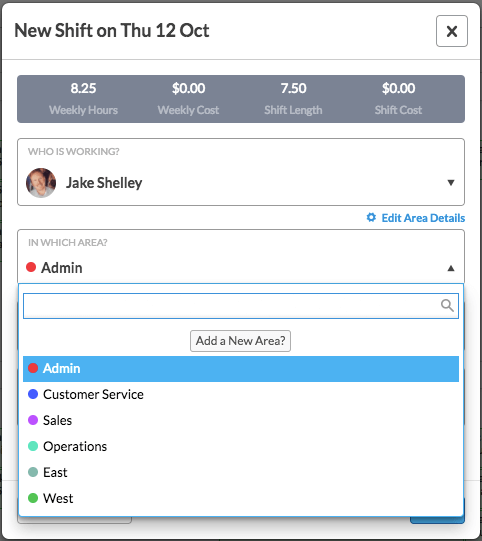 We’re always looking for ways to make life easier for businesses with shift based workers. Scheduling your team in a single click? Now that’s easy. Single Click Scheduling – Save time, money and energy without cutting corners. With Auto-scheduling you can create the best schedule for your business with a single click. Accurately forecast labour demand – Auto-Scheduling takes the guesswork out of building your shift structure. Accurately forecast how many people you need at any time, using multiple demand signals (like sales, foot traffic and bookings). No more surprises – Use historical and third party insights to forecast the manage of things you can’t control, like weather or major events. With auto-scheduling you’ll always have the right amount of staff when it matters most. The right team, every time – Set your priorities, like lowest cost, shift equality or matching past preferences, and Auto-Scheduling will fill your schedule with the best team to match your business needs. Auto-scheduling also learns who your best staff are (the ones that turn up on time, and don’t pull out last minute) and makes sure they’re rostered on when you need them most. Manage your compliance worries – Set the scheduling rules for your business (and any other important conditions, like making sure you’ve always got someone with First Aid on site) and let your compliance worries fade away. Once you’ve set the right rules, Auto-Scheduling will create optimised, legally compliant schedules every time. Sound amazing but not sure how it would work for your business? No problem. I will be running a live Webinar next Wednesday (7pm, April 4 April EDT) / Thursday (9am, April 5 AEST). Click here to sign up. Alternatively, check out our handy Help Docs for more detail on how to set your business up with Auto-Scheduling. The post Auto-Scheduling: the best scheduling update ever! appeared first on Deputy. At Deputy, we constantly ask ourselves how can we offer more flexibility to match how business owners currently operate. Most recently we’ve focused on offering you the ability to schedule the way that works for your business. With our latest updates to Scheduling, we hope to do just that! Before today, you could only schedule staff using a Day, Week or Month view. But from today we’re extending that flexibility so you can now schedule staff using a 2-Week or 4-Week calendar view. Further, we’re also adding the ability to distinguish each of your areas with a splash of color – one of the most requested suggestions. You asked. We delivered… and it gets better – we’ve also included some nifty new tips to make scheduling even easier! It’s important to us that you schedule in a way that parallels how your business operates. By offering that flexibility with our new views, we hope to make scheduling your staff just that much easier. Aligning your schedule with your bi-weekly (aka ‘fortnightly’) pay cycle is now a breeze with our new 2-Week views. Because employees’ total working hours are calculated in real time as you schedule, this is perfect for businesses who track overtime and time off over a 2 week period rather than a single week. Using our 2-week schedule templates, you can save more time, especially if your business has rotating weeks (Week A, Week B). Simply save your 2 week rotation template, load the template in an upcoming period and notify staff – all in a few clicks. Additionally, if your business operates with a 4-Week scheduling rotation rather than a 2 week rotation, we’ve got you covered too. Introducing our 4-Week scheduling view! You’ve seen our Day view by Area and now you can also check the pulse on a single day to see where you do/don’t have coverage with the new Employee: Day scheduling view. Sometimes, viewing the schedule doesn’t give you the whole picture of the upcoming week. Digging deeper you might find that not all staff are scheduled to the correct areas or that not all areas have coverage to meet customer demand. That’s where we can help. Now with colors for your areas of work, you can distinguish between the different roles and departments in your business. This will aid visual people to schedule staff even faster and help keep an eye on coverage for all areas. You’ll then be able to see your selected colors while you schedule. Adding to that, the color you select for your areas will also be used when you export your schedule to Excel. The ability to print or export to Excel is also supported for all our new scheduling views. Print the schedule. Pin it to the wall. Keep staff informed! You can now filter areas with multiple keywords. E.g. to show North and South areas, search “north south”. Clone shift has been increased from 50 to 500 shifts at a time! Overall various performance updates. In many cases we have reduced load time of heavy rosters by 50%! We hope you enjoy these updates. We are not stopping here. Some exciting updates are on the pipeline that will make Rostering (aka Scheduling aka Rota-ing) a breeze in the coming holiday period. We’d love to hear from you – what’s your biggest pain point when scheduling staff with Deputy? Share your feedback by commenting below! Been Simply Black and White appeared first on Deputy.